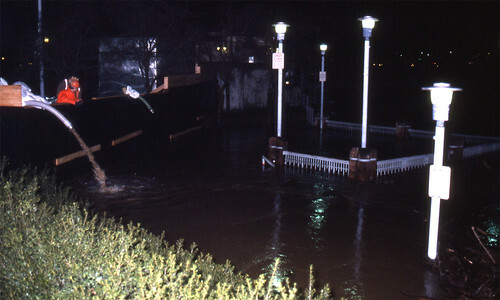 The winter of 1995-96 was one of the wettest on record in the Pacific Northwest. As early as November, there were signs this would be an unusual water year. Heavy rains in the last week of November and early December brought flooding in Clackamas and Tillamook counties, and in several parts of Washington. 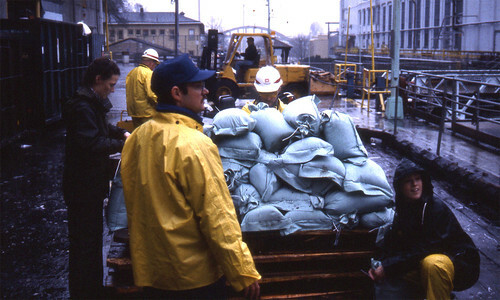 Working with local, county, state, and federal agencies, the Corps provided technical advice, assistance, and 160,000 sandbags for the flood fight. December and January saw continued rain, with Willamette and Columbia basin reservoirs filling much earlier than normal. 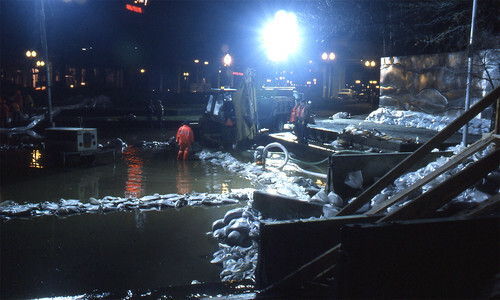 Corps engineers kept an eye on the pools, and as they reached capacity, began increasing releases at several projects, including Detroit, Applegate, Lost Creek, Willow Creek, Fern Ridge and Lookout Point. In January, a combination of northerly Arctic air and subtropical moisture caused heavy snow over the Cascades, increasing the snowpack by 50 -70 percent across Oregon. Late January and early February, bitterly cold temperatures froze the saturated ground. Then the cold spell broke. On February 5, a series of intense surges of subtropical moisture began inundating western Oregon and southwest Washington. Coast Range and Cascade snowpacks, already 200-300 percent above average, began rapidly melting. 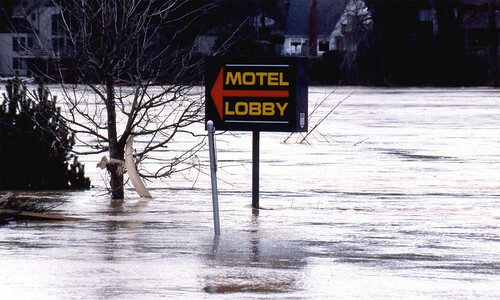 Precipitation surpassed all-time records at many locations. At Laurel Mountain in the Coast Range, an incredible 27.88 inches fell in just four days. The combination of record-breaking rain, warm temperatures, and a deep snowpack brought severe flooding to many parts of northern Oregon. 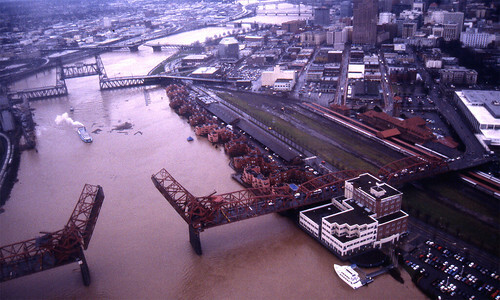 River levels were comparable to those of the hundred-year flood of 1964, the largest flood event in Oregon since flood control reservoirs were built. Streams rose quickly on February 6 and 7. At Vida on the McKenzie River, for example, the flow jumped from 4,000 cubic feet per second (cfs) to 20,000 cfs in just one day. 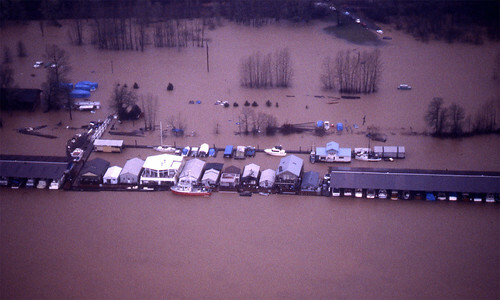 Several rivers, including the Tualatin, Pudding, South Yamhill, and Nehalem, reached record flood levels. 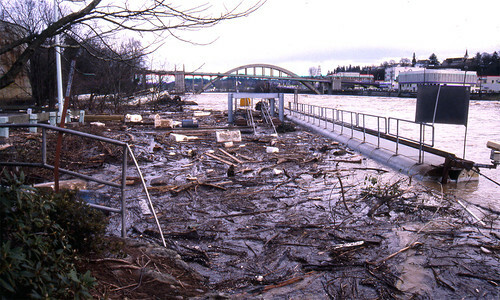 To keep the Willamette River from flooding downtown Portland, Corps staff worked around the clock coordinating the operations of 60 dams throughout the Columbia River Basin. British Columbia Hydro was asked to reduce releases from Hugh Keenleyside Dam in Canada so the U.S. Bureau of Reclamation could reduce its water releases from Grand Coulee Dam. Public utilities in the Mid-Columbia region also reduced outflows. Releases from Corps dams on the lower Columbia were manipulated to take advantage of the limited flood storage capacity there. 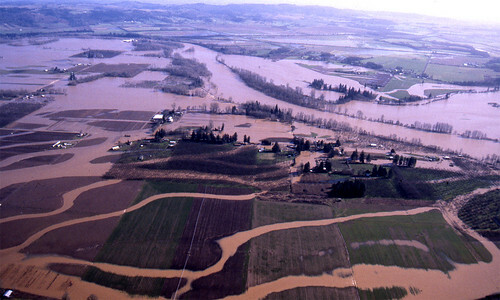 And releases from 11 Corps storage dams in the Willamette Basin were reduced to minimums. 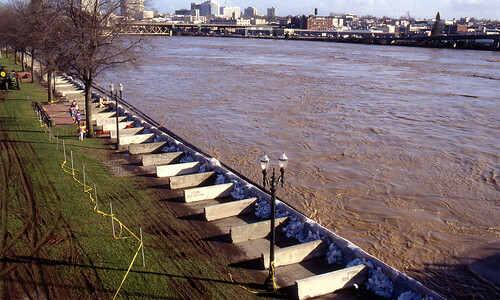 In a massive community effort, volunteers and emergency workers extended and reinforced downtown Portland’s seawall. Fortunately, the hastily-built extension was never needed. 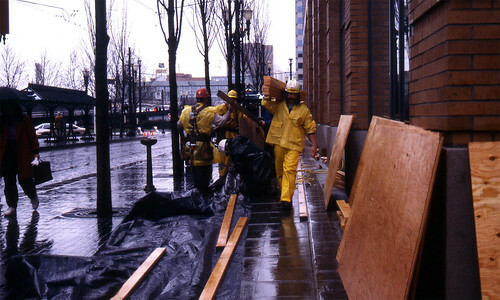 By coordinating with other agencies to reduce releases and carefully managing flows at all its projects, the Corps kept the river below the top of the seawall and prevented flooding in downtown Portland. Other areas were harder-hit. 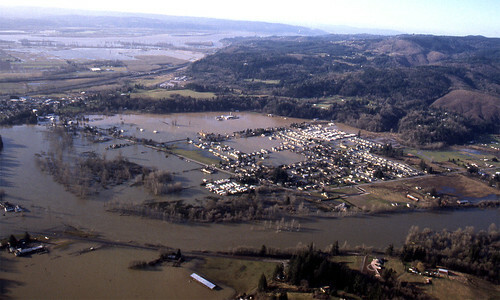 Lake Oswego, Oregon City, Tillamook, and Clatskanie in Oregon and Kalama, Woodland, and Cowlitz County in Washington experienced severe flooding. 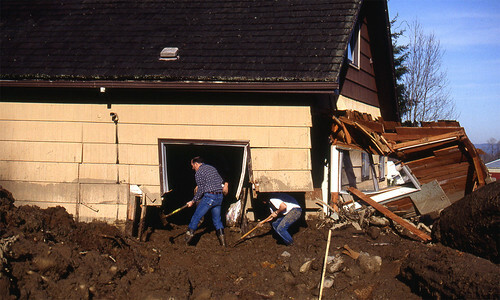 But in terms of overall flood damage prevention, the effort was a stunning success: more than 3.2 billion in damages prevented throughout the region. 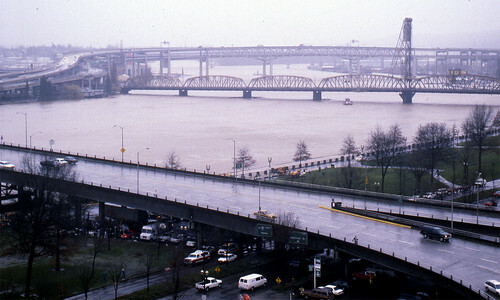 Despite the fact that Corps dams control only 27 percent of the water in the Willamette Basin, they were able to reduce river levels two feet in downtown Portland and at other locations in the Willamette Valley. 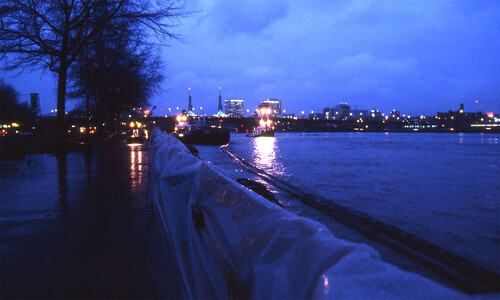 By February 10, flows began leveling off. 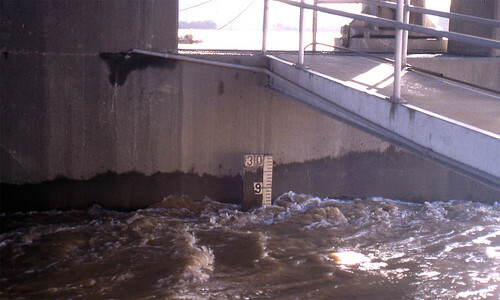 Corps engineers continued to make hour-by-hour adjustments, releasing as much water as possible from full reservoirs. 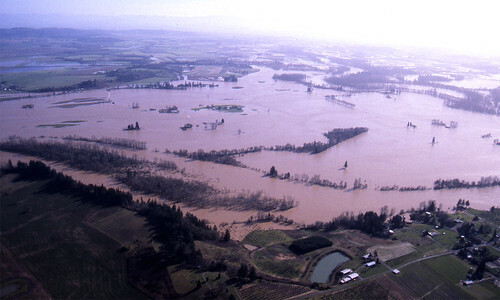 At one point, many Willamette Basin reservoirs were at or near capacity. 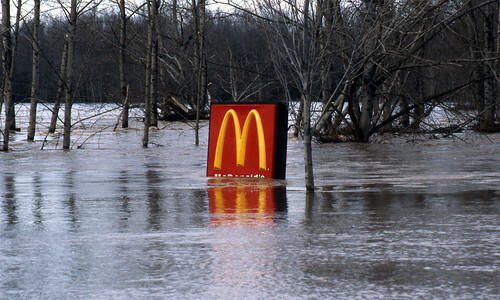 But the worst was over: the heavy rains abated and rivers began to recede. 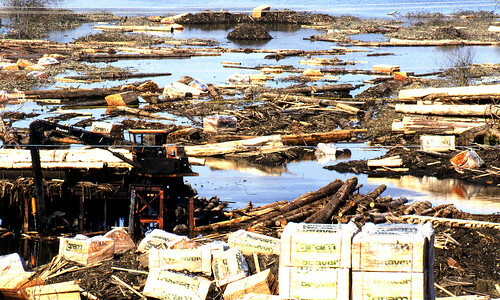 Once the immediate threat had passed, cleanup became the next priority. 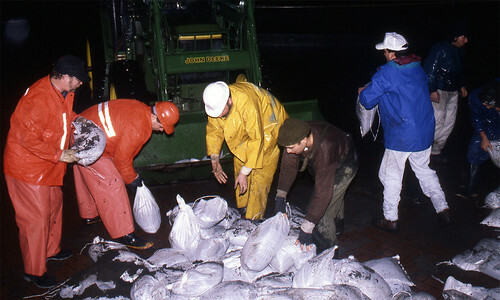 Operations staff worked to remove debris from locks and dams. 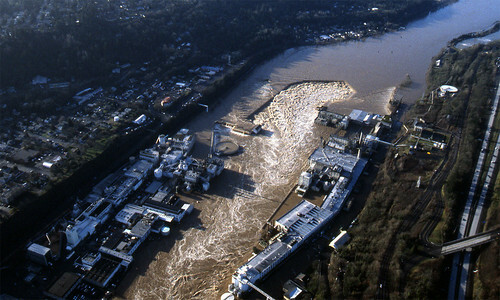 Engineers began to assess damage at Willamette Falls, where the navigation locks were seriously damaged and had to be closed for several weeks. 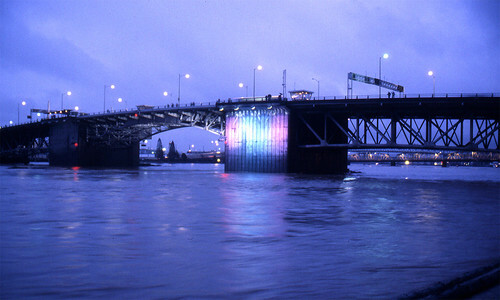 Surveyors began monitoring the Columbia shipping channel to identify shoals resulting from the flood. 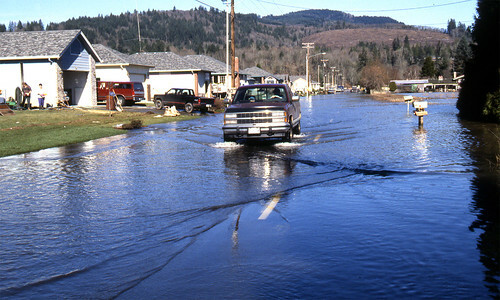 And regulators streamlined the permitting process, allowing individual flood recovery efforts to go forward while maintaining environmental protection standards. 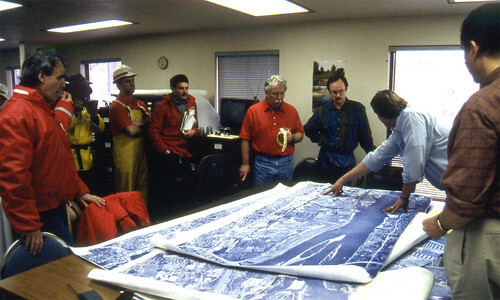 Throughout the flood event, project managers at each dam had checked the structures and found them all working as designed and showing no signs of distress. After flood waters receded, levees and dikes were quickly inspected and those showing damage were scheduled for prompt repair under the Flood and Coastal Storm Emergencies public law and the Corps’ operation and maintenance authority. 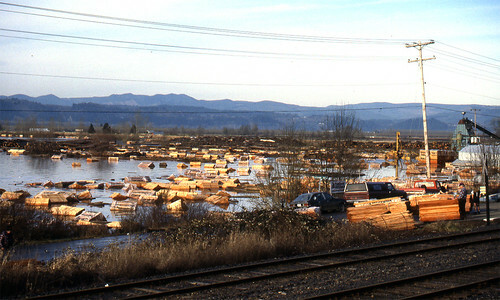 A total of 32 levees and bank protection projects in Oregon and six in Washington eventually were repaired. 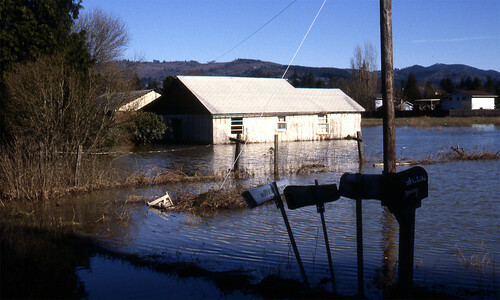 Longer term, the flood limited recreation opportunities at some Willamette Basin lakes. On the Middle Santiam River, log jams 20-30 years old broke loose, dotting Green Peter and Foster lakes with logs and woody debris. Blue River and Cougar lakes on the McKenzie River also had considerable debris, making boating and water skiing potentially dangerous. Much of the mess was removed the following spring. 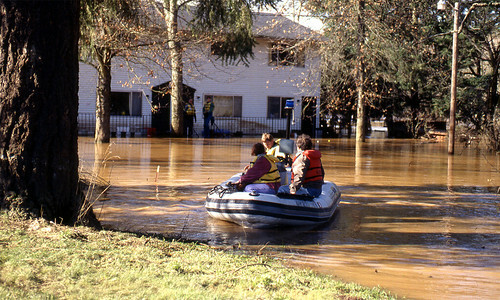 As a follow up, the Corps joined forces with the State of Oregon Emergency Management Office in September 1996 to conduct a series of community workshops on what to do before, during, and after a flood event. One section focused on the responsibilities and expectations of city and county governments and key response agencies. 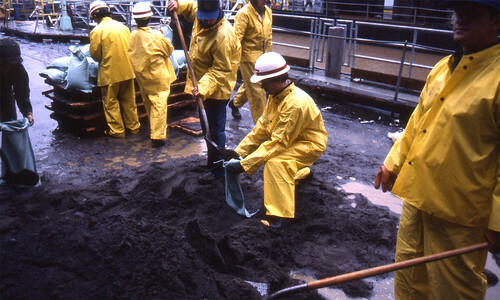 A second section for public works agencies, volunteer organizations, and schools taught flood fight techniques, safety, and sandbagging. The workshops continued through December. 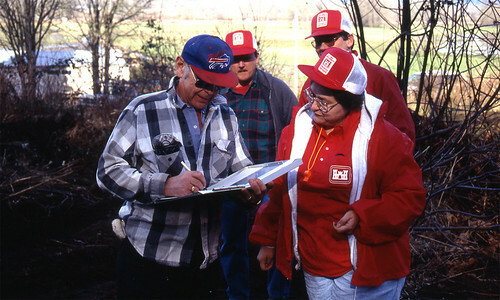 The Corps of Engineers received significant public recognition for its efforts during the flood of 1996. 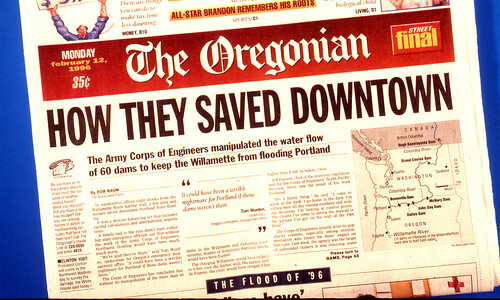 The Portland Oregonian, the state’s largest newspaper, credited the Corps for saving downtown through its coordination of water flows. 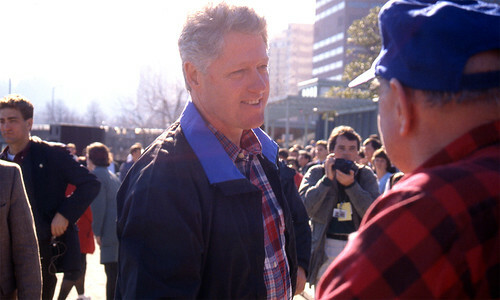 President Clinton mentioned the Corps contribution during his brief visit to flood-impacted areas. 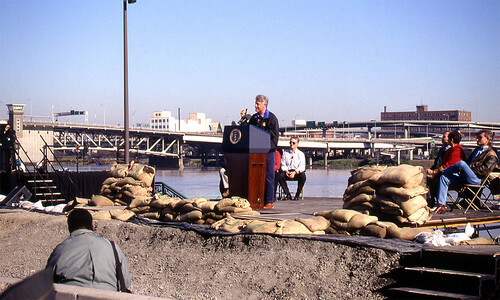 And Vice President Gore later presented his National Performance Review Hammer Award to Portland District and North Pacific Division at a special presentation along the Portland waterfront. The Bonneville Power Administration, Bureau of Reclamation, and City of Portland also received Hammer Awards, which are presented to teams of federal, state, and local employees and citizens working together to build a better government. 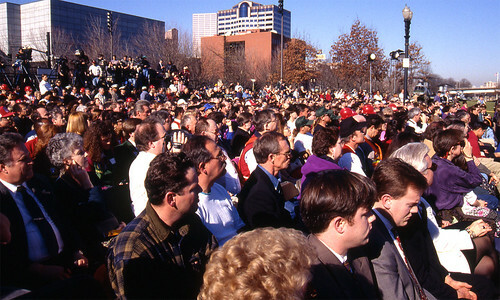 Hundreds of individuals contributed to the Corps’s flood-fighting success. 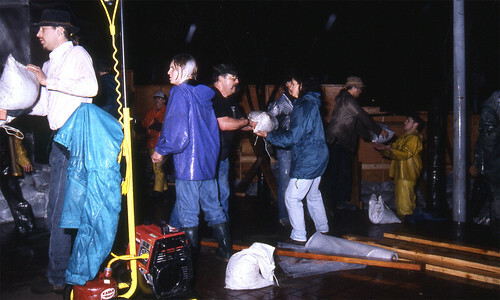 In addition to their regular work, employees filled, loaded, and stacked sandbags; transported stranded citizens; pumped water from basements; and coordinated emergency communications. They shored up levees, checked water quality, and answered thousands of extra phone calls.